Unionization of the telephone industry during the first three decades of this century was confined to a few scattered pockets of organized workers. The first union to attempt to organize telephone workers — the International Brotherhood of Electrical Workers (IBEW) — achieved limited success during these years. These early organizing efforts did not include women who worked in the telephone industry. 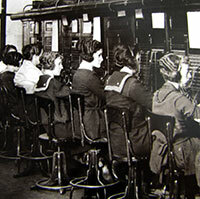 It was not until 1912 that the IBEW accepted telephone operators — generally women — as members. In 1919, IBEW’s telephone department claimed 200 telephone locals with 20,000 members. Frightened by the prospect of legitimate unionism on a large scale as a result of Burelson’s statement, AT&T encouraged employees to form and join company dominated unions (usually called associations or committees). The company associations succeeded in virtually destroying the existing IBEW telephone locals. By 1923, IBEW had been ousted in every location except Montana and the Chicago Plant. Company associations dominated the telephone industry until 1935. It prohibited the employer from engaging in certain activities which were defined as unfair labor practices (this included setting up and promoting company unions). It protected union and collective activity. In addition to organizing, it protected workers who take part in grievances, on the job protests, picketing and strikes. Strengthened by the new rights gained under the Wagner Act, new independent unions began to spring up across the country. As the number of independent unions grew, their leaders recognized the desirability of joining together in an organization where they could exchange ideas and coordinate national activities. NFTW was never a national union, rather it was a federation of sovereign local independent unions. NFTW’s lack of authority over the affiliated local unions left it at a serious disadvantage in dealing with a single-headed giant like AT&T. In December 1941, following the attack on Pearl Harbor, the AFL and CIO voluntarily gave no-strike pledges to the federal government for the duration of the war. In January, 1942, President Roosevelt created the National War Labor Board (NWLB). The NWLB was charged with settling all disputes between labor and management that threatened war production. The NWLB and twelve Regional War Labor Boards were composed of an equal number of representatives from management, labor and the private sector. All of the labor representatives appointed to the Board came out of the AFL and CIO. This was a great concern to the NFTW which was not affiliated with the AFL or CIO and felt that the National War Labor Board and Regional Boards would not effectively protect the interests of telephone workers and that the wages of telephone workers would suffer greatly during the war. The concerns of the NFTW were borne out by events. The average real wage of a telephone worker dropped from 83 cents an hour in 1939 to 70 cents an hour in 1943. According to the Bureau of Labor Statistics, telephone workers in 1939 occupied the twenty-second place on a list of average weekly earnings of workers in 123 industries; by early 1945, they had fallen to eighty-sixth place on this list. At hearings before the War Labor Board, NFTW’s Ohio Federation presented a report revealing the starting and top rates of telephone operators in 17 Bell System companies. The report showed that in 1944, starting operator rates varied from a low of $16 a week to a high of $23 with top rates ranging from $26 a week to $34. A Wisconsin operator starting at $16 a week could not reach the top rate of $27 in less than 16 years! As a result of these wage disparities, telephone unions brought numerous cases before the National War Labor Board and the Regional Boards. Response to these appeals was exceedingly slow, and by mid-1944, there were 85 cases brought by telephone unions still waiting to be ruled upon. The continuation of inadequate wages and the failure of the Boards to respond to union appeals led to increasing dissatisfaction on the part of telephone workers. These feelings came to a head in November, 1944, when the Dayton telephone workers went out on strike. Within 3 days the strike had spread to 25 cities in Ohio and within 6 days to Washington, D.C., Chicago and Detroit. At that point the government capitulated and agreed to establish a national board modeled on the NWLB that would only handle the cases of telephone workers. On December 29, 1944, the National Telephone Panel (later to be renamed the National Telephone Commission) was established. It had two members each from the public, industry and telephone labor sectors. Its mandate was to hear and adjudicate all telephone cases and to formulate basic telephone wage policy. The Telephone Panel was much more effective that the National War Labor Board. By the end of 1945, when it was terminated, it had heard 55 disputes involving 180,000 workers. When the war ended in August, 1945, the wages of telephone workers remained below those of many industries. Contract negotiations stalled and the presidents of the NFTW affiliates authorized the Union’s Executive Board to call a nationwide strike at 6:00 a.m., March 7, 1946. In the early morning hours of March 7, workers around the country prepared to walk the picket lines. At 5:30 a.m., after 20 hours of bargaining, NFTW President Joseph Beirne and Cleo Craig, AT&T Vice- President in charge of negotiations, signed the Beirne-Craig memorandum. A strike had been avoided and for the first time in history, AT&T had negotiated a national agreement with the Union and committed its associated companies to that agreement. While a major victory was won in the 1946 negotiations, the basic weakness of the NFTW had revealed itself. During negotiations, 34 of 51 affiliated unions broke away and signed separate agreements. This weakness in the NFTW structure was exposed with devastating consequences in the 1947 strike. In 1946, AT&T was not prepared for a strike. But in 1947, AT&T was not only prepared for a strike, it forced NFTW into strike action. AT&T was determined not to repeat the Beirne-Craig type of national settlement. It flatly refused to bargain on an industry-wide basis. AT&T approached bargaining with a divide and conquer strategy. The company did not make a wage offer until three weeks into the strike and made the offer contingent upon the affiliates agreeing not to clear it with NFTW’s policy committee. Five weeks after the strike began, seventeen contracts had been signed. The strike collapsed and the NFTW was finished. During the 1947 strike, AFL and CIO unions lent their moral and financial support despite the fact that NFTW was not affiliated with either the AFL or the CIO at the time. International unions in both the AFL and the CIO aided the strikers with contributions totaling $128,000. This support was very important in helping NFTW workers survive the strike and regroup into a strong and truly national union. In June, 1947, a truly national union, the Communications Workers of America, came into being. The first CWA convention took place that month in Miami with 200 delegates representing 162,000 workers. The delegates adopted the first CWA constitution which converted the former autonomous organizations of the NFTW into a three-level union: the National Union, 39 Divisions and the Locals. Joseph Beirne was elected President; Carlton Werkau, Secretary-Treasurer. Those who were in favor of affiliation were clearly in favor of affiliating with the CIO rather than the AFL. This was because the AFL could only offer CWA status within an existing international union, the IBEW. Then too, the CIO stood for Industrial Unionism—one union for one industry. 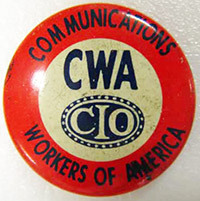 In February of 1949, CWA’s Executive Board recommended affiliation with the CIO and in a referendum, the membership approved the CIO affiliation. At the 1949 Convention there was general agreement that the structure of the union needed to be changed to a more coordinated approach to the telephone companies. The three-level structure established under the 1947 Constitution created 39 Divisions and 39 different ways of bargaining, striking and handling finances. 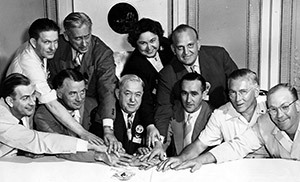 The 1949 convention mandated that the Executive Board establish a special Constitution Committee to investigate the possibility of setting up a two-level structure. * When CWA changed to a two-level structure, eleven Districts were created (9 geographic Districts and Western Electric Sales and Western Electric Installations). In 1953, Districts 10 and 11 were dissolved. The consolidation was completed in 1986 when Districts 5 and 8 were dissolved. During the hearings, which lasted for eleven days in August and September, 1950, the subcommittee heard testimony on these issues from representatives of CWA, AT&T and the associated Bell companies. Joseph Beirne’s testimony alone lasted five days. The basic cause of poor labor-management relations in the Bell System revolved around the inability of the union to bargain at a level of management which had the authority to make final decisions. The Bell System had actively and continuously conducted an anti-union campaign, including ads in the public press and interference in CWA affairs. In 1951, after two days of heated debate on the issue, the delegates to the annual convention voted to establish a national defense fund with contributions of 50 cents per member per month. It was decided in a roll call vote with 133,047 in favor and 101,883 opposed. Ultimately, Southern Bell’s attempt to break the union was unsuccessful. A one-year contract was signed that gave across-the-board gains to CWA members; wage increases; the right to arbitration for suspensions, discharges and job vacancy fillings; reduction of work tour hours; and, most significantly, recognition of the right to strike. The 1955 strike was an early landmark for CWA because of its scope, duration and success. 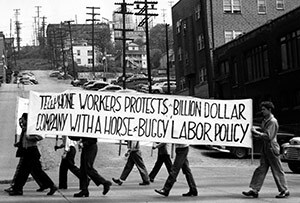 In October, 1963, CWA members went on strike against General Telephone of California for wages and benefits comparable to those enjoyed by Bell employees in the state. At the time, it was possible for a General Telephone worker and a Bell worker to be doing the same type of work across the street from each other, but the General Telephone employee would be receiving considerably less compensation for the job than a Bell counterpart. In 1965, Convention delegates, at President Beirne’s urging, adopted CWA Growth Resolution #1 which endorsed the Triple Threat program and clearly stated that organizing was a top priority of the union. It was Beirne’s program for broadening the membership base and expanding CWA’s influence in the areas of politics and legislation as well as collective bargaining. For Beirne believed — and it has remained CWA’s philosophy — that all these activities are mutually dependent and equally vital to CWA’s overall success in representing its members. 1969 brought the first national strike against the Bell System since 1947. Some 200,000 CWA telephone workers walked out because AT&T refused to agree to wage increases that would meet the rise in the cost of living. The strike lasted 18 days with AT&T ultimately agreeing to a raise in wages and benefits that totalled nearly 20 percent over a three-year period. It was in this round of negotiations that CWA was able to get AT&T to agree to pay the full premium for the health care plan. Prior to these negotiations, workers had to pay three-fourths of the total premium. Recruiting, hiring and promotion practices which discriminated against women. The EEOC tried for two years to force AT&T to comply with the equal opportunity requirements of the Equal Pay Act of 1963 and the Civil Rights Act of 1964. Finally, on January 18, 1973, AT&T, the EEOC, the Department of Labor and the Justice Department reached an agreement on the charges. The settlement, called the “consent decree,” provided for compensation for the victims of past discrimination and an affirmative action program for changing the pattern of discrimination in the Bell System. The settlement included $15 million in back pay to 13,000 women and minority men, and an estimated $30 million in wage adjustments for women and minority workers. A second consent decree signed on May 30, 1974, provided $30 million back pay and wage adjustments to 25,000 employees in lower management positions. 400,000 CWA members nationwide went on strike against the Bell System in 1971 for wage increases to offset the devastating inflation of the previous three years. After a one week strike, CWA achieved the biggest economic package ever negotiated with the Bell System and obtained, for the first time, a cost of living adjustment clause (COLA) and big city allowance. In addition, wage progressions schedules were shortened to 5 years and the vacation time was improved to 2 weeks after one year’s service. The total wage benefit package amounted to more than 33.5% over the life of the agreement. A large share of the credit for those successful negotiations went to the Task Force ’71 Mobilization program which President Beirne set up to activate the membership in support of CWA’s bargaining objectives. Task Force ’71 consisted of 50,000 local union leaders (one for every 10-15 members) who led training sessions, put up informational posters, passed out bargaining leaflets and worked to keep their members informed and activated. The Task Force ’71 participants wore “small potato ’71” pins to identify themselves as part of this important corps of local leaders. 1971 proved a busy year for CWA, but did not deter more than 1,500 delegates, alternates and guests from attending the first “special convention.” The delegates adopted several constitutional amendments at this convention. The most important of these was the adoption of a constitutional amendment dealing with the duties and responsibilities of Locals. The amendment required all Locals to carry out the union’s policies, participate actively in political and legislative activities, participate in local officers and stewards training programs, and attend all District, state and area meetings. Also adopted at the convention was a constitutional amendment creating CWA Retired Members Clubs and providing three year terms (prior to 1971 there were 2 year terms) of office at both the International and Local level. In 1973, 6,000 CWA members in Indiana, Ohio and Kentucky went out on strike against the General Telephone companies of those states. The strike lasted two months in Indiana and Ohio before settlement was reached, but the workers in Kentucky were on the picket line for five months before their contract demands were met. The Kentucky workers were forced out on strike again in 1976. This time the strikers were out for 200 days before a settlement was reached. During the 1973 CWA convention, extensive discussions were held on the methods by which CWA dealt with the problems of women and minority members. As a result of these discussions, the National Executive Board established a Blacks and Other Minorities Structure Study Committee and a Female Structure Committee. In November, 1973, these committees convened at CWA headquarters and prepared reports for the Executive Board which included recommended policies and procedures. Extended discussions at the Executive Board meetings in January and February of 1974 led to a resolution recommending that the President develop a “Committee on Equity” concept from the national to the local level of the union. The Executive Board authorized the appointment of a National Committee on Equity consisting of rank and file members from each District which is still in place today. 1974 was an historic year for CWA. For the first time, the Bell System agreed to conduct unified national bargaining. The Company had finally given up the charade that claimed its operating companies were independent, self-controlled businesses. The new bargaining was structured so that wages, benefits and contract language would be negotiated at one national table. The 1974 bargaining session was significant because unlike its 1968 and 1971 predecessors, it did not result in a CWA strike. Joseph Beirne, who had pursued the goal of unified national bargaining for all of his 27 years as CWA President, did not seek reelection and died on Labor Day of 1974. He was succeeded by Secretary-Treasurer Glenn E. Watts, who had first gone to work for C&P Telephone in 1941 and was a member of the founding generation of CWA leaders. Three of the most bitter CWA strikes of the 1970’s took place at independent telephone locations: a six month strike at Rochester, New York Telephone over an attack on wage levels, at General of Kentucky in 1976 over medical benefits and work rules, and a three month walkout at New Jersey Telephone over the issue of supervisors performing bargaining unit work. CWA held its first annual National Women’s Conference in Minneapolis, Minnesota. Conference participants attended plenary sessions, workshops and discussion groups. Resolutions on ERA, child care and job pressures were presented to the CWA Executive Board. On July 12, 1979, the Executive Board authorized President Watts to establish CWA’s National Organizing Department. Over the course of the decade, CWA began to expand into fields outside of telecommunications. In July, 1980, the CWA Public Workers Department was created. One of the biggest successes in the public sector was the organizing of 34,000 New Jersey state workers in 1981. Today, CWA represents 100,000 public and health care workers across the country. The Committee on the Future was created in July, 1981 by action of the CWA convention. The 14 member committee was composed of one elected representative from each District and a representative from the Public Workers sector. After a year and a half of study and debate the Committee on the Future submitted its final report and recommendations to the delegates to the special convention in Philadelphia in March, 1983. The 1,750 delegates adopted 10 resolutions and two constitutional changes proposed by the Committee on the Future. The first national minorities conference was held in 1982. In 1983, only months before the Bell system was to be broken into separate companies, CWA opened national contract negotiations. Not surprisingly, it was a difficult round of negotiations. AT&T was demanding givebacks from workers and seeking substandard job titles. 700,000 CWA members went out on strike on August 7 for better wages, employment security, pension plan changes and health insurance improvements. The strike lasted 22 days when the telephone industry agreed to meet the union’s demands. This would be the last time that CWA would be able to negotiate at one national table for all its Bell System members because divestiture was only a few months away. In response to recommendations by the National Committee on Equity for training opportunities devoted to minorities, the Executive Board established the Minorities Leadership Institute – a three week intensive study program. The MLI is held annually with participants recommended by District Vice Presidents. For CWA, the most significant event of this decade was the divestiture of AT&T on January 1, 1984. The break-up of the Bell System was of great concern to the union. CWA feared that divestiture would bring relocations, personal hardship and repudiation by the new independent Regional Bell Operating Companies (RBOCs) and their subsidiaries of contract gains previously won by the union. Personal hardship and relocation did in fact occur, forcing CWA to work hard to preserve the gains that four decades of sacrifice and solidarity had achieved. Job security issues catapulted to the top of the list of bargaining priorities for 1986. During this difficult period, President Watts often reminded the members that it was AT&T that had broken up, not CWA — the union remained as unified, committed and strong as ever. Also in this year, the members of the Federation of Telephone Workers of Pennsylvania voted overwhelmingly to merge with CWA. The Executive Board created District 13 to accommodate the 12,250 newly affiliated men and women. 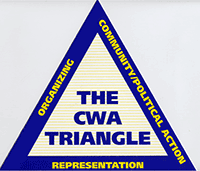 Changes occurred within CWA itself during the mid-1980s. There were not only structural changes taken in response to the divestiture of AT&T, but there was also a leadership change for only the second time in CWA’s history. In 1985, Present Glenn E. Watts and Secretary-Treasurer Louis Knecht retired after serving eleven years in these offices. Elected to replace them were Morton Bahr and James B. Booe, respectively. In 1987, members of the International Typographical Union (ITU) were welcomed into CWA. Members of the oldest union in the AFL-CIO, representing union typesetters and mailers throughout the U.S. and Canada, had approved affiliation with one of the youngest. Recognizing the distinct nature of the work that these members perform, the union created a new Printing, Publishing and Media Workers Sector (PPMWS) and an International PPMWS Vice President. The merger of ITU, with 9,000 Canadian members, once again made CWA an “International Union.” Canadian telephone workers had left CWA in the early 70’s to establish the Communications Workers of Canada. 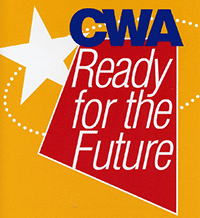 In 1988, CWA celebrated its 50th anniversary. The convention took place in New Orleans, the site of the NFTW’s founding in 1938. From its roots in the NFTW, CWA has grown to become one of the most respected unions in the United States, representing telecommunications workers, state and local employees, printers and health care workers. CWA continues to fulfill its commitment to bettering the lives of workers and their families. CWA Mobilization was kicked off at the ’88 convention in preparation for a major round of bargaining in 1989. Mobilization—organization, education and collective action— was a way for CWA to get back to the basics of unionism. Members were recruited to work one-on-one to educate members about bargaining and workplace issues. Mobilization strategies and techniques became a way of life for many CWA locals. Mobilization by CWA members around AT&T bargaining “proves how successful we can be when we stick together and fight together,” according to President Morton Bahr. Faced with the solidarity of mobilized workers, AT&T backed off on health care cost shifting demands. The settlement for 175,000 workers broke new ground on child and elder care by creating a $5 million fund to establish care centers and support facilities, granting parental and elder care leave with a job guarantee and paid medical and dental for six months. Mobilization also was key for NYNEX workers who spent 17 weeks on the picket line fighting management’s attempts to shift health care costs. “Their victory in holding the line against concessions is a victory for tens of thousands of other telephone workers. Because of their sacrifice, others won’t have to endure strikes in our next round of negotiations because we’ve sent a message throughout the industry—we’re solidly united,” President Bahr declared following the Dec. 4, settlement. But the strike was not without a price. Local 1103 member Jerry Horgan lost his life on the picket line when he was struck and killed by a scab driving a car at a NYNEX facility. In the summer of ’89, delegates to the convention voted to change the Defense Fund rules so strikers would receive a flat weekly payout beginning in ’92 and continue needs-based funds to provide emergency relief. Delegates to CWA’s 53rd Convention resolved to make the nineties the decade of Wall to Wall for CWA. Delegates reaffirmed their commitment to building the union by working towards making every organized unit “CWA Wall to Wall.” Delegates also made changes to the CWA Constitution to allow the Committee on Equity and the Women’s Committee to give annual reports and recommendations to future conventions. In an effort to put the bitterness of the ’89 strike behind, CWA and NYNEX negotiated an unprecedented early settlement 11 months before contract expiration. The agreement called for a 13% wage hike, retention of COLA and fully paid health care. It included a breakthrough agreement on company wide organizing, neutrality and card check recognition. CWA became the biggest union in the Lone Star state of Texas following the affiliation with the Combined Law Enforcement Association of Texas (CLEAT). The Association represents 12,000 police officers, deputy sheriffs and jailors throughout the state. Members at AT&T worked for six weeks beyond contract expiration during the summer of ’92, carrying out an intensive mobilization strategy against the telecommunications giant. It was the largest bargaining unit ever to attempt a coordinated inside tactics strategy—100,000 members, 500 Locals, 50 states and thousands of work locations. The coordinated inside tactics by members and massive external mobilization efforts, including generating community and AT&T customer support, proved that sometimes applying pressure in different ways can work better than a strike. Barbara J. Easterling was elected as the union’s first woman secretary-treasurer. Easterling, an Executive Vice President since 1985 and one time telephone operator, was elected at convention. After more than 30 years headquartered at the Mercury Building, in Washington, D.C., the union moved to a new building across town which is two blocks from the Department of Labor and four blocks from the Capitol. The National Association of Broadcast Engineers and Technicians (NABET) affiliates with CWA. NABET represents engineers, technicians and other broadcast workers at NBC and ABC, TV networks and independent TV stations and Cable TV production companies. CWA membership continues to grow outside the traditional telephone units with three big organizing wins in 1993 at universities. 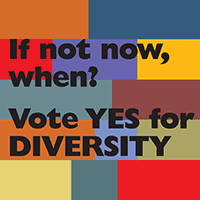 Four thousand graduate students working as teaching and graduate assistants at the State University of New York (SUNY) saw the end to a 13-year organizing struggle when they were finally allowed to vote for union representation. Seventeen hundred clerical and technical workers at the Bloomington campus of Indiana University voted for CWA after a four year campaign. The Union of Technical and Professional Employees (UPTE) with 700 members affiliated with CWA. The professional and technical workers hold nonacademic positions throughout the nine campus University of California system. Members of The Newspaper Guild (TNG), representing 40,000 news industry workers in the U.S. and Canada, vote overwhelmingly to affiliate and eventually merge (in 1997) with CWA. Linda K. Foley is elected TNG’s first woman President. After 5 months with no contract, Bell Atlantic finally fell in line with the mainstream of the telecommunications industry offering its 37,000 CWA workers double digit wage and pension increases, employment security protections and access to future jobs. Over 6000 members were suspended for such actions as sickouts, refusing overtime and passing out “Block 900” flyers. The workplace mobilization effort was strengthened by a multi-million dollar advertising and corporate campaign. In 1995 and early 1996, 7800 professional and technical university workers joined the CWA family. In 1995, 4000 technical workers employed by the University of California system voted to be represented by CWA in UPTE-CWA (Union of Professional and Technical Employees). Fifteen months later, in March 1996, 3700 professional researchers throughout the University of California system voted overwhelming for CWA representation as part of UPTE-CWA. The Newspaper Guild (TNG), representing 40,000 news industry workers in the U.S. and Canada, merges with CWA. A five year campaign that integrated continuous bargaining, membership education, political action, mobilization and strategic organizing, culminates in March 1977 with CWA and SBC (Southwestern Bell Corporation) signing the most far-reaching card check agreement in the union’s history. A similar agreement was reached with PacTel in April. CWA joined forces with two of the United Kingdom’s biggest telecommunications unions — the Communications Workers Union and the Society of Telecom Executives — and endorsed an Atlantic Alliance of the three unions to exchange information and to plan coordinated strategies to protect our members and to organize new members in the global telecommunications marketplace. In the aftermath of the 41-day strike and a 2-day general strike against the privatization of the Puerto Rico Telephone Company, CWA entered into an alliance with the PRTC workers. The agreement calls for joint bargaining and organizing strategies in response to the acquisition of the PRTC by GTE. In a representation election that culminated a 14-year effort, the workers of the Southern New England Telephone Company joined CWA. October 1, 113,000 members of IUE voted to merge with CWA at their 27th National Constitutional Convention held in Cleveland, Ohio. Earlier, at CWA’s 62nd Annual Convention, held on August 29th, delegates voted to welcome them. The merger brings CWA’s numbers to more than 700, 000 members. On August 6th, 87,000 CWA telephone workers went on strike against Verizon communications. Later in August a settlement was reached. The settlement included a break through agreement for neutrality and card check recognition to help Verizon Wireless workers unionize. Other highlights are reductions in mandatory overtime and provisions to reduce stress in customer service and operator call centers. The Association of Flight Attendants merged with CWA, adding its professionalism and expertise on airline industry issues. Convention delegates adopt CWA Ready for the Future Resolution which called for members at every level of the union to examine the challenges CWA faces and identify ideas and recommendations to best meet them. A discussion guide was prepared and distributed to locals. During the eight months following adoption of the resolutions, thousands of meetings were held across the union and a dedicated RFF website open to all members produced a lively dialogue. Labor leaders, academics, journalists and elected officials took note and praised CWA as one of the very few unions willing and determined to engage members such an open discussion about some of the most serious and critical aspects of the union. Convention delegates adopted “Ready for the Future: CWA Strategic Plan” with 11 specific items. A bold new Strategic Industry Fund (SIF) was established as part of the plan. The fund allows for the financing of major large scale campaigns to increase our bargaining power and carry out pro-active campaigns. The strategic plan also established a National Telecom Office to increase focus on the telecom industry and mandated that the Executive Board bring to the 2007 convention specific proposals to increase Board diversity. Convention delegates adopted a resolution and corresponding constitutional changes adding four at-large diversity Executive Board members to be elected at the 2008 convention. CWA and Ver.di form new global union TU for T-Mobile workers. Congress extends FMLA protections to flight attendants a big victory for AFA-CWA. 45,000 CWA Verizon workers from Virginia to New England went on strike for 16 days. A settlement was reached in 2012. Larry Cohen was re-elected President and Annie Hill was elected Secretary Treasurer. The Executive Vice President position was eliminated. CWA, Sierra Club, NAACP and Greenpeace launch the Democracy Initiative(DI) to restore the core principals of political equality; money in politics, voter rights and senate rule reform. The convention approves the establishment of Growth Funds to support building a movement for economic justice and democracy and enhance the union's organizing, leadership development, research and industry analysis. CWA leads successful “Give me 5” campaign to fill all five NLRB seats. After a 19-year struggle, 9,000 new American Airlines passenger service agents voted to join CWA members at US Airways to form a new bargaining unit of 14,500 agents. By an 86 percent vote, airport and reservations agents overwhelmingly chose union representation making it one of the largest labor organizing victories in the South in decades. Convention delegates adopt red as the official color of CWA. At the TNG Convention, delegates approve changing the union's name to The News Guild-CWA, to better reflect the current news industry and diversity of Guild units.